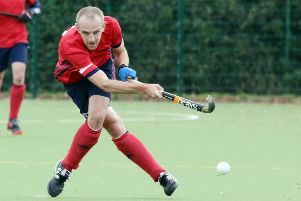 Despite seeing his Banbury side knocked out of the England Hockey Cup, manager Steve Brooker saw plenty of positives. After three consecutive South Premier Hockey League defeats, Banbury put in their best performance and claimed a point against leaders Spencer in a 4-4 thriller in division one. That was followed by Sunday’s England Hockey Cup second round thriller against National League outfit Oxford Hawks which ended 1-1 with Banbury losing 4-3 in the penalty shoot-out. For Sunday’s EH Cup game, Banbury called in keeper Jamie Lamb and fielded new signing Waqas Akbar. Lamb kept the National League side at bay until the last moments of the first half and saved one of the penalties in the shoot-out. Akbar marked his debut with a well taken goal and almost won it when his shot hit the post in the last minute. Brooker said: “We have been strengthened by the return of Louis Harris and recruitment of Waqas [Akbar] to play our best games and score our goal of the season so far against the leaders. We outplayed a National League side only to be denied a place in the next round by the post.